My Big Break is an interesting documentary about five roommates trying to make it in Hollywood who face the unexpected consequences of fame. 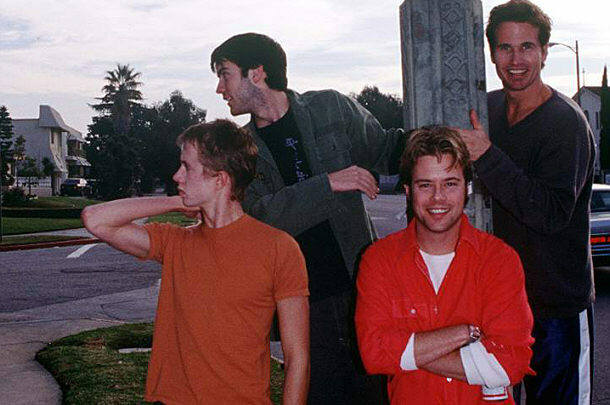 The five roommates consisted of one aspiring filmmaker and four struggling actors which include: Brad Rowe (Billy’s Hollywood Screen Kiss, Shelter), Chad Lindberg (October Sky, The Fast And The Furious), Wes Bentley (American Beauty, The Hunger Games) and a fourth actor, Greg Fawcett, who didn’t find fame or fortune like his buddies yet. In this documentary, you will see clips of the early days of the guys bunking in a house together while starting their careers and you’ll proceed to watch footage of each one gaining more notoriety and what comes along with it. You’ll watch the rise and the fall-out of what happens when things don’t go as they hoped or planned they would. You will also discover the pressures of the Hollywood film industry and how it pushed to alcohol and drug use as an escape. This film displays probably the most realistic look at Hollywood that I’ve ever seen. It took filmmaker Tony Zierra a total of 15 years to make this award winning film that was edited down from over 200 hours of footage. He had no money, no big stars or crew and had no idea where the careers of his fellow actor friends would take them. He was able to get some interesting ‘reality’ and ‘behind the scenes’ type coverage of red carpet events and more. His documentary also covers some of his own ups and downs in the process of getting the story out. I don’t want to give too many details about the film’s coverage of Tony Zierra, Brad Rowe, Chad Lindberg, Wes Bentley or Greg Fawcett in this documentary since I think they pretty much speak for themselves in the telling of the story. It’s an inspiring glimpse at life in the celebrity zone that I’m glad the guys let the public see. Anyone aspiring to be an actor or filmmaker anywhere in the world can connect and learn something from this documentary. Honestly, it will be better to watch it than to go into this career field blinded by fairytale dreams. As a matter of fact, I’d recommend anyone that deals with any actors or filmmakers in any capacity, whether it’s managers, agents, publicists, etc. to watch it to be better prepared. There are currently 1 Comment on My Big Break : Celebrity In The Making : Fame In Hollywood. Perhaps you would like to add one of your own? Sounds really interesting. I definitely will keep watching for it, as I like the premise a lot.